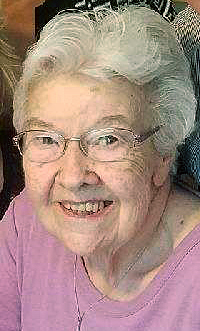 Alice M. Iannone, 91, of Spotswood, passed away peacefully on Thursday, February 7, 2019 at her home. Born in New York City, New York, Alice was raised in Union City and also lived in West New York for several years before settling in Spotswood in 1962. She was a long time communicant of Immaculate Conception Church, Spotswood. Alice was a loving wife, mother and grandmother who loved spending time with her family. She enjoyed cooking, reading and loved travelling, both in the United States and abroad. She was a grade school spelling bee champion and an extraordinary Scrabble player. She retired in the early 1990's from her job as an administrative assistant and bookkeeper, which she did for both Johnson & Johnson and the Spotswood School District for many years. She is survived by her husband of 62 years, Frank, of Spotswood; her children, Marie A. Iannone and her life partner, Charles Fischer, of Chapel Hill, NC and Frank Iannone and his wife Magali, of White Plains, NY, and; her grandchildren, Lucia and Isabella. Funeral services will begin at 9:15 AM Tuesday from Spotswood Funeral Home followed by a 10:15 AM Mass of Christian Burial from the Church of the Immaculate Conception, Spotswood. Entombment will be in Holy Cross Burial Park, South Brunswick. The family will receive friends on Monday from 2:00 to 4:00 PM and 7:00 to 9:00 PM at the Funeral Home. The family has requested that in lieu of flowers, donations honoring Alice's memory be made to the New Jersey Blind Citizens Association, Inc. at 18 Burlington Avenue, Leonardo, NJ 07737 or online at www.njbca.org. To leave a message of condolence for the family, please visit www.spotswoodfh.com. NJ Blind Citizens Assoc., Inc.